Pottery Ding (Cooking Vessel); Yangshao Culture; Neolithic period (ca. 5000 - 3000 B.C.E. ); This ding, made by the Yangshao Culture located along the middle and lower reaches of the Yellow River, is decorated with a string pattern, and heated quickly. The Yangshao culture (Chinese: 仰韶文化; pinyin: Yǎngsháo wénhuà) was a Neolithic culture that existed extensively along the valleys of the Wei River and the middle Yellow River (Huanghe) in northern China during the Neolithic period (c. 12000 to 2000 B.C.E.). The Yangshao culture is dated from around 5000 B.C.E. to 3000 B.C.E. and is one of the earliest settled cultures in China. It is named after Yangshao, the first excavated representative village of this culture, which was discovered in 1921 in Henan Province. The culture flourished mainly in the provinces of Henan, Shaanxi, and Shanxi. Over a thousand Yangshao Culture sites have been found including the Banpo Site in Xian, and Jiangzhai at Lintong County, Shanxi Province. Shanxi it is regarded as the center of this culture because it possesses the most Yangshao sites. The Yangshao culture exhibits the first evidence of settled agriculture in China, producing millet, wheat, rice, kaoliang, and possibly soybeans. They kept domesticated animals such as pigs and dogs, chickens, sheep, goats, and cattle, hunted fished with nets, and gathered fruits and nuts. Yangshao is well-known for its red, painted pottery, decorated in white and black with human faces, animal, and geometric designs. Axes and arrowheads were made of polished stone; other artifacts include elaborately worked objects in jade, and flint, bone, and ground-stone objects for daily use such as stone axes, shovels, millstones, arrows, and harpoons. The Yangshao culture (Chinese: 仰韶文化; pinyin: Yǎngsháo wénhuà) was a Neolithic culture that existed extensively along the valleys of the Wei River and the middle Yellow River (Huanghe) in northern China. The Yangshao Culture developed during the Neolithic period (c. 12000 to 2000 B.C.E.) and is dated from around 5000 B.C.E. to 3000 B.C.E.. It is one of the earliest settled cultures in China. The culture is named after Yangshao, the first excavated representative village of this culture, which was discovered in 1921 in Henan Province. The culture flourished mainly in the provinces of Henan, Shaanxi and Shanxi. The Yangshao people were originally hunter-gatherers who eventually settled into villages which were divided into areas for living, for firing pottery, and for burying the dead. The archaeological site of Banpo village, near Xi'an, is one of the best-known ditch-enclosed settlements of the Yangshao culture. Another major settlement called Jiangzhai was excavated out to its limits, and archaeologists found that it was completely surrounded by a ring-ditch. The Yangshao show the first evidence of food production in China. The subsistence practices of Yangshao people were varied. They cultivated millet extensively; some villages also cultivated wheat, rice, kaoliang, and possibly soybeans. The millet was ground into flour using mortars and pestles. Millet, rather than rice, is still the staple grain consumed in northern China. The exact nature of Yangshao agriculture—small-scale slash-and-burn cultivation versus intensive agriculture in permanent fields, is currently a subject of debate. However, Middle Yangshao settlements such as Jiangzhi contain raised floor buildings that may have been used for the storage of surplus grains. They kept such domesticated animals as pigs and dogs, as well as chickens, sheep, goats, and cattle, but much of their meat came from hunting and fishing. They fished with nets, and gathered fruits and nuts, including chestnuts. The Yangshao people may also have practiced an early form of silkworm cultivation. Their stone tools were polished and highly specialized. Other artifacts include elaborately worked objects in jade, and flint, bone, and ground-stone objects for daily use such as stone axes, shovels, millstones, arrows, and harpoons. Over a 1,000 Yangshao Culture sites have been found including the Banpo Site in Xian, and Jiangzhai at Lintong County, Shanxi Province. Shanxi it is regarded as the center of this culture because it possesses the most Yangshao Culture sites. Villages were of different sizes. Some large ones were strictly laid out, such as Jiangzhai Village, which is divided into dwelling places and cemeteries by dikes. Five architectural groups, each of which had many houses, were scattered around a central square. The Yangshao buried their dead in round pits, along with food and utensils which indicate the beginnings of ancestor-worship. Females have frequently been found buried in the center of a grave, surrounded by fine pottery and other possessions, suggesting a matriarchal society. The Yangshao culture is well-known for its red painted pottery, one of two major types produced during the Neolithic period in China. Before 2000 B.C.E., Yangshao were making coiled red earthenware that was fired in kilns at 1000°C-1500°C. Axes and arrowheads were made of polished stone and other tools were made of stone chips. Millet was the main crop of the Yangshao. They domesticated two main animals, the dog and the pig, with the pig being the more important, painted in white and black with human faces, animal, and geometric designs such as spirals. It is possible that these highly-decorated pieces were produced specifically for funeral rites. 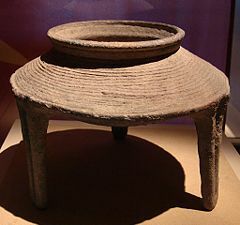 Unlike the later Longshan culture, the Yangshao culture did not use pottery wheels in pottery-making. Pieces found buried in graves include tall rounded jars, flaring bowls and three-footed bowls which resemble a type of bronze pot (ting) produced in large numbers for ritual purposes during the later Shang dynasty (1750 – 1040 B.C.E.). Excavations found children buried in painted pottery jars. The Yangshao phase is followed by that called Lungshan. Majiayao phase, approximately 3300 B.C.E. to 2000 B.C.E., in Gansu, Qinghai The earliest discoveries of copper and bronze objects in China occur at Majiayao sites. Machang phase, approximately 2400 B.C.E. to 2000 B.C.E. ↑ Dorothy Perkins, 1999, Encyclopedia of China the essential reference to China, its history and culture, 597, New York: Facts on File. ↑ Banpo, China: Yangshao Neolithic Village, About.com. Retrieved November 22, 2007. This page was last modified on 2 April 2008, at 19:19.